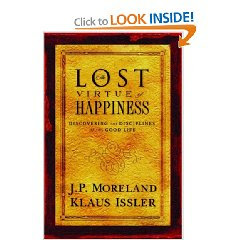 I am reading a book on the Lost Virtue of Happiness. So far the authors seem to indicate that we have looked outside of our spirituality to find happiness that is, of course, really pseudo-happiness. What struck me was their insistance that happiness must be practiced to be deeply felt. Likening life to a golf swing they insist that the bad habits must be worked out by practicing the correct swing. Likewise, they would insist, that life must be lived out by practicing the good until the bad is a distant memory. Deep spiritual change they say is a result of living out the spiritual disciplines. One of those is happiness. By "acting happy and confident" ( my terms not theirs) ones attitude changes. By changing ones attitude the deep abiding change of character becomes lasting. There are so many people in this world (and the church too) that are miserable. They are not content with contentment but need to have something to complain about at all times. They are cynical and harsh; judgmental and brutish; they are brooding and bitter; and they cannot be happy for those who are expereincing joy nor can they experience sorrow with others who sorrow. Since this is a command of Christ- I wonder if it wouldn't be important for us all to just simply practice being happy. Here is my list of things that one might do to practice happiness. 1. Smile Stand in the mirror and smile. Notice how much more pleasant you look. Determine that you will smile at many people today. Note their reaction. Smiling at strangers often disarms them! 2. Choose the Positive i am not saying that you should ignore evil or dysfunction but don't live in the shadow of the negative faith crushing news media outlets! Even if the world is coming apart at the seams, you are probably doing pretty well. After all you ahve a computer on which to read this blog! What things do you do to practice happiness? Do you feel that "faking happiness" is phony or practical? 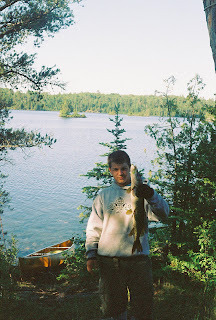 The family tradition- at least for the men in my family has been to take a spring trip to the wilderness in Canada. 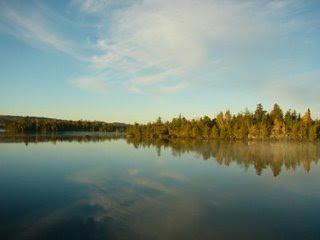 We go to a Provincial park in Ontario called Quetico. No motors are allowed. We paddle canoes, sometimes as far as 50 or 60 miles, to move through out the wilderness. it is pristine, unblemished, we drink the water from the lakes and eat what we catch. It isn't exactly living off the land but it is close. We have seen moose and bear come to make a visit in our camp ground, eagles and much wild life. I think that there are a couple reasons that I like the trip is that it is a wonderful bonding trip with my boys. We learn the ways of the earth, act silly, tell stories, and drink hot black coffee around a fire until we can't stay up any longer. It is hard work, but in a way that I don't normally do. Carrying the canoes across arduous passages and boulder strewn creviced is a workout! But the fresh fried Walleye filets every night are worth the effort. My boys seem to like it. I think they will be bringing me when I cannot do it on my own. As a tradition it is excellent. We usually read books aloud, discuss the scriptures, or wonder aloud about our dreams and futures. The moon and stars oversee the evenings, the eagles soar over us by day. The campfire and the camp cooking warms the soul. The friendships and the love last forever.